Board and committee members play a large role in organizing community events, keeping the lines of communication open with residents, and solving problems within the community. Spotlight those serving in these leadership positions by posting them on pages of their own! In this article we’ve outlined how you can display these members on your website so residents can stay informed of who these members are and ways to contact them. Before getting started, make sure the members that you’d like to display on these pages have a registered and approved account on your website. Display a full list of board members in a clean and professional directory by using the “Board members” page type. To add members to this page, press the “Manage board members” button, and choose each member from the list of registered joint members in the “Board member” column. Next, you can include their official title, as well as the date their term will end in the optional “Term ends” field. As the board changes, you can easily update this page by visiting the “Manage board members” screen to delete, add, or re-arrange the list accordingly. Using the information stored in each member's profile, our system will automatically add each member’s profile picture along with their name and any permitted contact information. Highlight the committees that do so much for your community using the “Committees” page type. There is no limit to the number of committees you can add, so feel free to include them all! Re-visit the “Manage committees” button to edit information about the committee or its members. You may also remove and add committees at any time. Although we have multiple layers of advanced protection measures in place that make email addresses more difficult for bots to steal, we recommend adding page restrictions so that only registered and approved members will have access to the content listed. This will keep members’ information available to only those within your community. The contact information that displays on the “Board Members” and “Committees” pages is pulled from the information they have listed on their member profile and is adjusted based on their privacy preferences. Therefore, if you notice contact information missing for a specific member, this could mean they haven’t included all contact information in their member profile or have decided to hide their contact information in their privacy preferences. Each person may manage their privacy preferences by clicking on their account name and selecting “Member settings” from the drop-down menu. 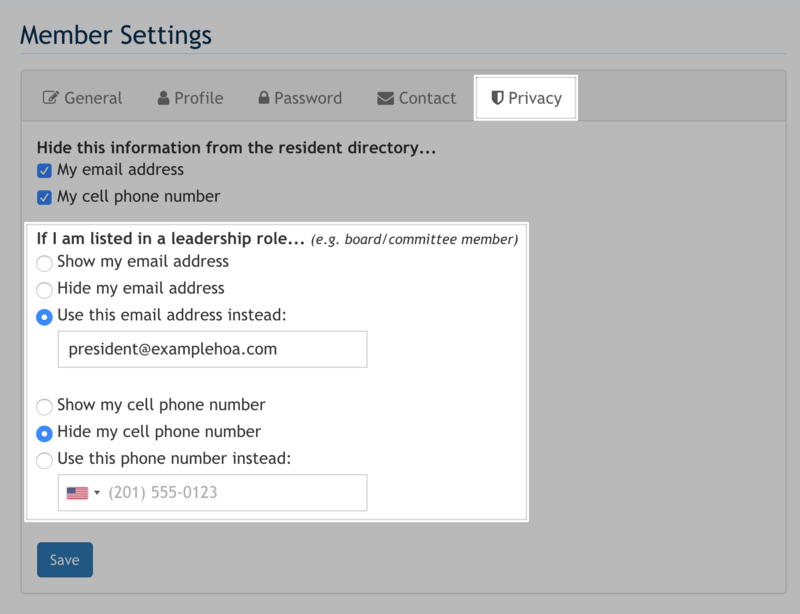 View and adjust the privacy preferences specific to the “Board Members” and “Committees” page types on the “Privacy” tab in the section labeled “If I am listed in a leadership role…” as shown in the screenshot below. These preferences can be managed by each joint member listed on an account. Therefore, if more than one member on an account is involved in a leadership role within their community, they can each decide on what they’d like displayed on the page(s) they’ve been added to. Adding the “Board Members” and “Committees” pages to your website is an excellent way to inform residents of who holds these important and necessary roles in your community. Additionally, these pages have been designed to display information residents can use if they need to get in touch with those members, or if they’re interested in becoming involved with one of these groups.